Before I begin, let me tell you that I just purchased a BSF 55N breakbarrel spring rifle. This rifle was originally sold by Air Rifle Headquarters and was sent back in 1980 for some repair work. I had one of these years ago that I let get away, but this one will remain with me. It’s one of four air rifles that broke the 800 f.p.s. barrier back in the 1970s and was one of the first air rifles to carry the magnumlabel. I lived in the German city where this rifle was made when I served in the Army, so I’ve always had a soft spot in my heart for it. There will be a report coming in the future. But, today, we’re back with the Theoben Fenman. Last time, I told you about the bad experience I had when the Fenman first arrived. After the rifle was fixed, it functioned perfectly and made me glad I’d bought it. I told you that the power was down to 12 foot-pounds, which is a Crosman Premier 7.9-grain pellet going 825 f.p.s. That may not seem like much in this day of 1400+ f.p.s., but the Fenman was accurate and easy to shoot on top of everything else. I was able to connect with my intended targets with all that velocity, and that makes more of an imporession than missing them with double the energy. Here’s one of the few color photos I have of my old Fenman. I was at the DIFTA sight-in range on this day.Back in those days, all Theoben gas spring rifles were owner-adjustable, through a screw on the back of the spring tube. Remove the screw, and you gained access to a port where air could be pumped into or released from the spring. Remove this screw at the rear of the spring tube and gain access to the Theoben gas spring. With the screw out, you have access to a Schrader valve (like a common bicycle tire valve). The pin isn’t visible in this shot, but it’s there. Pushing it releases air pressure. With a special Slim Jim pump, you can add pressure to the spring.Of course, it was the adjustability of the spring that caused the problem I reported in the first installment. To pressurize the rifle correctly, you were supposed to fill the spring and fire the rifle through a chronograph. When it stopped gaining speed, you were done. My Fenman never stopped gaining speed, which is why it was sent to me over-pressurized. It should have topped-out at 12 foot-pounds, but it was producing almost 15 foot-pounds when I got it. Back down at 12 foot-pounds, the cocking effort was about 42 lbs. which is hard but not unreasonable. How the gun felt when fired was its principle joy. The recoil was very light (the rifle had to be held lightly for this) and the firing jolt was very minimal. For those who’ve shot Theoben Eliminators or Beeman Crow Magnums, a Fenman is a completely different experience. The trigger – can you say perfection? A Theoben Fenman trigger is based loosely on the Gamo trigger design, but it’s no Gamo! It is, without a doubt, the best spring rifle trigger I’ve ever felt. The break is so crisp that it’s like breaking the proverbial glass rod, and the trigger blade is nearly vertical, which gives you wonderful control. The movement is straight back until the break. The only thing that would have made it better was the presence of an overtravel adjustment. I credit this trigger for a lot of the exceptional offhand accuracy of the rifle. 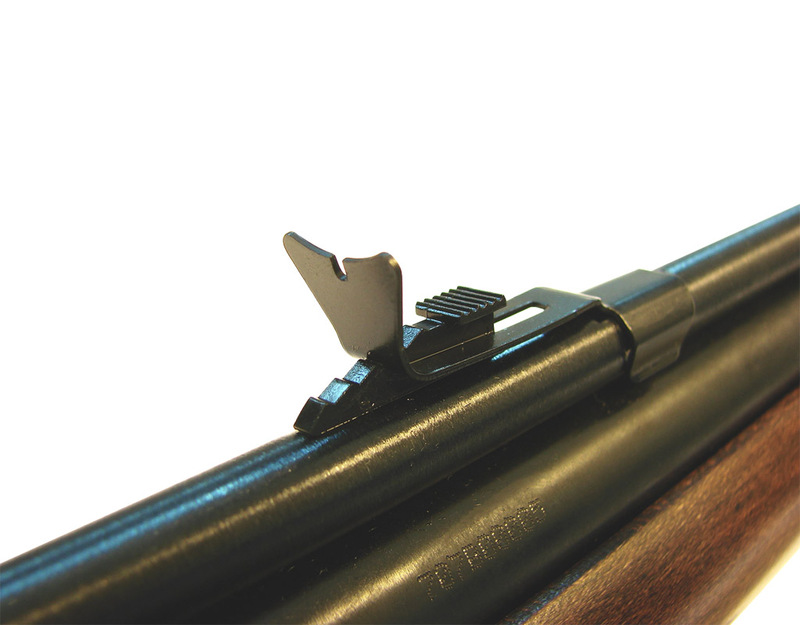 The Fenman trigger is adjustable and has a lot of similarity to a Gamo trigger. It is, however, glass-crisp and very light. The automatic safety (lever in front of the trigger) must be pressed forward before shooting, but can be reapplied any time the rifle is cocked.Don’t forget that you can leave a gas spring cocked for hours if you like. The spring does not degrade. Having a safety that can be reapplied becomes an important feature in what is, essentially, a hunting gun. My .177 liked Beeman Kodiak pellets best of all, giving me 5-shot groups of less than one inch at 40 yards. That’s pretty darned good for any springer! Believe it or not, the actual barrel length on this rifle is only 7.375″ long. The barrel brake adds some extra length to make cocking easier. For those keeping score, I think this is the shortest rifle barrel I’ve ever tested, and yet it can develop almost 15 foot-pounds in .177 if pressed. Why didn’t I keep it? The answer is that the caliber was wrong for me. Had it been a .22, I think I would still own the rifle. I loved the little .22 I shot, but somehow the .177 didn’t thrill me in the same way. Yes, it was much faster, but the .22 just seemed magical in the accuracy department. Sadly, they don’t make the Fenman anymore, though you can find a used one if you look. A modern equivalent, in experience, but not in finish, is the Gamo Whisper in .177 with an Air Venturi gas spring. That rifle thrills me in the smaller caliber in exactly the same way the Fenman did in .22. I have an airforce handpump. When I stop after five minutes of pumping the handle doesn’t stay down, it rises. It pumps air into the air reservoir fine. It that normal or is something wrong with the pump? The feedback of air isn’t normal, but all my handpumps do it, and they all still work fine. That would be a Hill, an FX and an Axsor. One pump out of the three that I have will keep having the pump handle rise overnight…..not connected to anything. I keep pushing it down, and the next day it has come back up a few inches. Works good, but can see that keeping the handle down may help keep dust away from the pump shaft. Thinking about a bungee. What do you know about other Theoben airguns that heve been discontinued like the Taunus, the Olymbus or the Dual Magnum? Have you ever shot any of them? No, my Theoben experience has been limited to the Eliminator/Crow Magnum and the Fenman. Your comment on the trigger reminds me of my 4-year-old Shadow 1000 with many thousands of rounds through it. It feels so good that it’s hard to believe it’s the same trigger as the one on my much newer and lower mileage 440. How does the Fenman trigger compare to the Rekord trigger? A TX200 trigger can be adjusted as nice as a Fenman trigger, but I doubt a standard Rekord – apart from the target trigger in the HW55 – can be as nice. Another great blog! So what is your opinion of the Crow Magnum .22 ? I have one and I love it, although it is very demanding. Can you test it? I will test the Crow Magnum. I wrote five separate tests for The Airgun Letter. I changed calibers from .25 to .20. I tested other Crow Mags whose owners thought they had found a way to have an easier-cocking rifle. Finally, Ben Taylor had to tell me how to clean the barrel so I could get the advertised accuracy out of the rifle. Believe me, I will report on the Crow Magnum for you. I only write this in this post because this is bothering me very much. My new rws c-mount is giving me problems. After a few shots, the whole mount starts to wiggle. You would expect the problem would come from a smaller part, but as I said, the whole mount moves. Is there anything that could solve this problem? I can understand how to adjust for elevation, but windage??? Short of twisting the whole sight on the barrel I am out of ideas. Not that it matters – I was going to get regular open sights anyway (like Beeman Sport Aperture Sight, or Crosman Williams Notched Blade Sight), but I don’t like the feeling that I am missing a grand idea somewhere. And thank you very much for running this blog – it’s quite interesting and useful. I notice how you get the velocity spread to test both rifles and pellets at the “muzzle” for consisenty = accuracy. I saw some advertised chronographs for the Eliminator at MV, 50 and 100 yards. The .20 appears to beat the socks off the .22 and .25 for retained velocity and energy. Obviously it is shooting a lot flatter as well. Can the .20 have a ballistic coefficent that good? Have you ever reproduced these retained velocities and energies? At this stage I can’t quite swallow it! Please ask a question only once. I answered this on the B-Square adjustable scope mounts – Part 3 post. You’re obviously right about that rear sight. I have seen the same thing you have seen, in “Airgunner” and “Airgun World” magazines. You would think that somebody actually tested this before constructing that ad campaign, wouldn’t you? I have not tested this, because it is NEXT TO IMPOSSIBLE TO TEST. The gun has to be accurate enough to not hit the skyscreens at 50 and 100 yards, AND (and this is the big one) you need a check chronograph at the muzzle for every shot. You would also have to align the 50 and 100-yard skyscreens according to the ballistics of every pellet tested (not just left and right, but up and down, too) and that would be an exceedingly daunting task – if it were even possible. I think it would take weeks to conduct a thorough test like that, and you would loose a hell of a lot of skyscreens in the process. I enjoyed the 2nd part of the Fenman series. Besides the trigger do you have any thoughts or comments on how the Fenman might be different from the current Evolution. What do you think about the Theoben “Evolution” trigger that is now offered on their H.E. Gas Ram system rifles. As I have said, I have no experience with Theoben guns other than the Fenman and the Eliminator/Crow Magnum. I can’t give an opinion on something I’ve never tried. I do know that when I shot Theobens they were fine air rifles – excellent in many respects. I thought the Eliminator/Crow Magnum had the “Evo” trigger mechanism. Did or do you like the trigger on those guns? Well if you ever get a chance to shoot some more Theobens I would enjoy reading about them. I read your blog daily. If that’s the case, then I do like that trigger. I always felt the trigger was one of the strongest features of the rifle. I own a Theoben Fenman .22 with the evolution trigger.Would like to add that it is a superb rifle ,well balanced and accurate. I haven’t heard of a Fenman without a safety, but if you have one they may exist. I say “may,” because it’s also possible that someone removed the safety lever from the trigger before you got the gun. The best thing for you to do is contact Theoben USA and ask about a possible safety for your rifle.